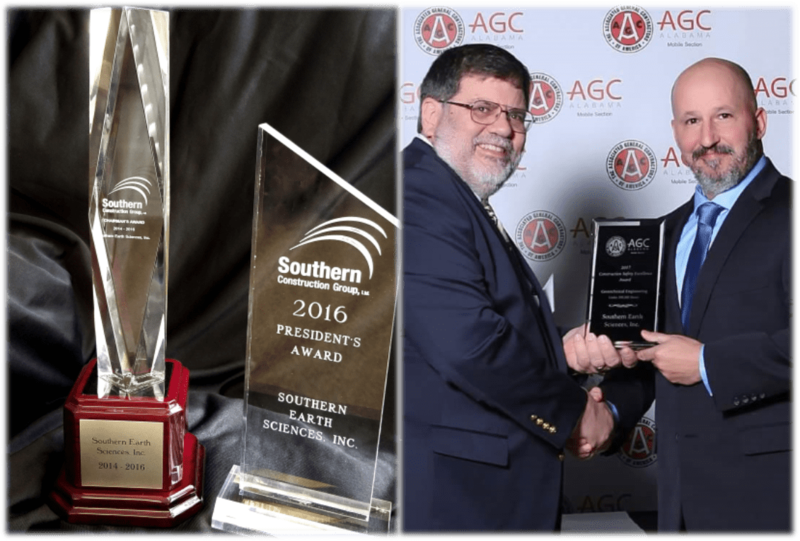 SESI Earns Multiple High-Honor Safety Awards - Southern Earth Sciences, Inc. : Southern Earth Sciences, Inc.
Southern Earth Sciences, Inc. (SESI) was recently recognized on two separate occasions for achievements in company safety records. SESI’s insurance captive, Southern Construction Group, presented SESI with the Chairman’s Award during the group’s annual meeting for maintaining a cumulative loss ratio of 0.00% for three consecutive plan years. This achievement was further magnified by being the only company out of 37 represented to achieve this record. SESI also received a President’s award for a 0.00% loss ratio for the most recent eligible plan year. The Company was also recognized by the Associated General Contractors (AGC) Mobile Section during the 16th Annual Construction Safety Excellence Awards held in March. SESI was presented with an Excellence in Safety Award in the Engineering Division. This local program is an ongoing effort by the AGC Mobile Section to recognize their members who have developed and implemented excellent safety and loss prevention programs through management commitment, employee training, and program innovation. “Over the past several years, we have been working hard to improve our safety record and bring our EMR below a 1 and maintain it for three consecutive years. In 2016 and 2017 we were able to obtain a below 1 rating and thanks to our employees’ hard work and diligence, we successfully made it through another policy year and are on-track again this year,” remarked SESI President, Lewis Copeland, Jr., P.E. Experience Modification Rate (EMR) is a number used by insurance companies to gauge both past cost of injuries and future risk. The industry standard is 1.0 with anything over being considered a risk. EMR can affect not only a company’s insurance costs but also their ability to maintain and secure contracts with clients. “We have been very diligent in our efforts to achieve this goal. We ingrain in our employees that safety is in their hands and we have seen our culture take shape around this mantra,” commented Toby Phillips, SESI Safety Director.